« Blockbuster to launch set-top box? It seems like a straight forward proposition, but there’s FUD — fear, uncertainty, and doubt — swirling around when it comes to the upcoming U.S. digital TV conversion. By Feb. 18, 2009, all broadcasters in the U.S. will be required to unplug their analog signal to broadcast solely on the digital spectrum. Considering the government just auctioned off freed-up spectrum, there’s no turning back. This far into the 2000s, this far into the digital age, you’d think the Big Switch would be a minor inconvenience for most people — that their primary TV sets are new enough to handle a digital signal, that whatever analog sets are in use are connected to a TV delivery service like cable, satellite, or fiber, and what analog sets connected to an antenna are located in spare bedrooms or the garage. But the digital TV conversion is surprisingly controversial with government bodies, industry and consumer advocacy groups, trade organizations, manufacturers, marketing researchers, and consumers pointing fingers and forecasting doom and gloom. In February, at the one-year-to-go mark, politicians and a Federal Communications Commissioner were putting the heat on the government to get its act together before it’s too late. Jonathan Adelstein, the commissioner, warned there would be a “state of mass confusion” if various Federal agencies don’t coordinate their efforts to inform the public sufficiently that Feb. 17, 2009, is the last day of analog broadcasting. The next day, an estimated 21 million households with TV sets that receive only over-the-air signals will go dark. The FCC and Congress hope that by raising the alarm now a bigger uproar can be prevented in February 2009. It seems like all the FCC and Congress have achieved thus far is fear, uncertainty, and doubt. Luckily, we’ve got — as of this writing — 313 days, 3 hours, and 44 minutes (see the countdown clock at DTVAnswers) remaining until the analog switch is turned off, so maybe cooler heads will prevail and the conversion will be relatively uneventful, like when the world didn’t implode during Y2K. Our advice at last100 is stay calm, do your own research (we’ll provide many level-headed links here), and pay attention. Lower the signal-to-noise volume. Don’t tremble in your comfy chair every time a new study is released, every time a network executive complains about a possible loss of audience, or every time a politician opens his mouth on the subject. Estimates vary regarding how many households might be effected by the digital TV conversion, but suffice to say the number seems to be between 19 and 22 million. Of these, about 14 million homes rely solely on analog TVs, according to Nielsen Media Research (via Reuters). About 70 million TVs are expected to be impacted. That’s a significant number, more than we thought. But it’s not a reason to panic, even for those who are expected to be hit the hardest by the conversion — according to some studies, the elderly, black viewers more than white or Asian, and Latinos, who use over-the-air TVs more than any other group. People with lower incomes, disabilities, and those living in rural areas are also expected to be effected. But in the overall picture, numbers don’t matter. What does is you, your situation, and what you do about it. If you subscribe to cable, satellite, or fiber services, all the TVs in your home are connected via some kind of set-top box. There’s no need to worry. 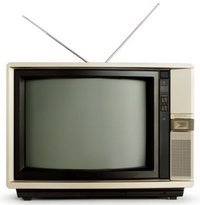 If you have TVs in your home not connected to a digital service — not everybody “rents” a set-top box for little-used TVs in spare bedrooms or the kitchen — you will need to upgrade those sets to continue receiving a television signal. Here, admittedly, it gets more complicated, but there’s no reason to panic. If your TV was manufactured after March 1, 2007, it comes with a digital tuner. Because of the impending analog-to-digital conversion, and because they are waiting for LCD and plasma high-definition televisions to come down in price, many consumers have been holding off buying new sets until the time is right for them. If you don’t want — or have the money — to buy a new television, older TVs can convert analog signals to digital through the use of a set-top box converter. Yes, we know reports have surfaced that nearly six million people with digital receivers may still lose TV signals (New York Times), according to a study conducted by Centris, a market research firm in Los Angeles. Even so, sources are appearing (Popular Science has an informative story here) and RadioShack, home of all the oddball electronics parts you’d ever need, has info here) that allow people to narrow down whether or not their TVs will work with any of the approved set-top box converters and what to do if any additional equipment is needed (an antenna, a signal amplifier, coax cable). Check out freelabs.com and Wikipedia for coupon eligible converter box comparisons. To its credit, the government is at least trying to help consumers purchase converters, which will help low- and fixed-income families and individuals, although we’re sure the support will ultimately not be enough. The U.S. Congress has allocated $1.5 billion to help consumers purchase converters, expected to cost between $50 and $70. Theoretically, a converter may cost $10 to $30 per TV to upgrade after the rebate — not as good as free, but every little bit helps. Households are entitled to two coupons, which can be applied for at dtv2009.gov or by calling 888-DTV-2009. Once you receive a coupon, you have 90 days to use it. Consumers are encouraged to act quickly as 33.5 million coupons are available, after which no more will be issued. After just a few weeks, coupon requests topped more than two million, or less than 15 percent of the estimated number of households that rely on traditional broadcasts. Already there are issues with the analog-to-digital conversion, as you’d might expect for something this large and significant. These frequencies have been in use since the 1930s, and this is the television industry’s largest undertaking since introducing color in the late 1940s. In addition to the Centris study, there are reports of companies scamming consumers (and the government). And clueless retailers. US Pirg released a report that indicated TV retail store staffs are not well versed in the DTV transition and that sales folks provided inaccurate information about converter boxes, could not give accurate info about the coupon program, and they got the February 2009 deadline wrong. While this is shabby and unacceptable, how does it differ from talking with a sales person in a Best Buy or Target these days? Retailers and sales staff are supposed to be properly trained and certified, but so far reports indicate this procedure has been largely ignored or is rubber-stamp approved. If congressmen and FCC chairmen continue to spew FUD-isms, you can bet retailers will get up to snuff quickly or suffer from the negative attention that’s sure to follow. Granted, the analog-to-digital TV transition is an important, complex undertaking, but is it really — as FCC commissioner Michael Copps said to Reuters — a “national problem” at this time? Could it be “catastrophic,” as some network execs predict? What it comes down to — what it always comes down to — is money. The networks fear the conversion will go poorly and that consumers will be more pissed off than they already are (viewership continues to decline.) No digital signals means no TV. No TV means less viewers for the networks. Less viewers means less revenue for networks, studios, and stations. “You could see a 5%-7% drop in the ratings in a heartbeat,” Shelly Palmer told Reuters. Palmer, president of the New York branch of the National Academy of Television Arts & Sciences, estimates a drop in viewership could translate into a $3 billion loss in revenue. Who knows. Maybe all this fuss and FUD is a brilliant strategy. But we won’t know for sure until February 2009. Or 312 days, 23 hours, 51 minutes from now. You mention that the coupons probably won’t be able to help the lower income or fixed income TV users…So what are they suppose to do? Is it aceptable for us to sit back and say “well you’re poor so you don’t need television or you’re old and on a fixed income so you don’t need television either?” Apparently these Americans don’t count….I should think there would be a lawyer out there smart enough to bring some litigation on behalf of the poor? How about denying access to freedom of information? 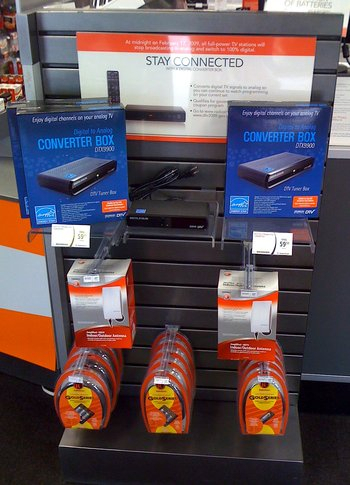 You can also check out reviews at http://dtvconverterboxes.blogspot.com. This helped me to pick out the best converter box for the features that I wanted. All the DTV hype never mentioned that existing antennas, like mine, might be woefully inadequate to the task. My Radio Shack antenna provides me with excellent VHF reception. When I reconnected it through the converter box I bought, I followed the initial setup menu, only to see a “NO SIGNAL” display on my TV. I live in a mobile home that’s completely encased in steel sheetmetal–siding and galvanized roof. When I first moved in, I found my “rabbit ears” to be entirely unsatisfactory. I bought a Radio Shack “stealth” bar antenna, since local regulations prohibit adding new external antennas. Life was good, but my reception of UHF signals was variable. Since DTV is broadcast entirely in UHF, and since digital signals are essentially received or not, I find that I must add the cost of a new antenna (estimated at about $100) to the $35 I already spent for each of my two converter boxes. Since I’m “between jobs” at the moment, and since my TVs are analog-only, I’m really glad we’re making this wonderful transition which will let me see what I’ve been getting since the color transition.